If you have a big drawing that you want to present to others, you’ll probably create views, but how about a menu to each view? 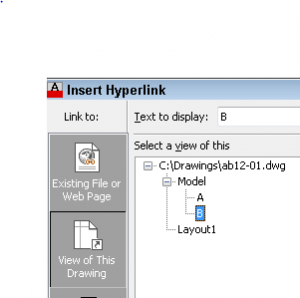 You can create hyperlinks to drawing views to easily navigate your drawing. Once you go to a view, you can use the View Previous feature to return to your menu of hyperlinks. Create your views, using the VIEW command. Create some text that refers to each view. You can only hyperlink an object, so you can’t hyperlink to a cell inside a table. I created a table and exploded it. 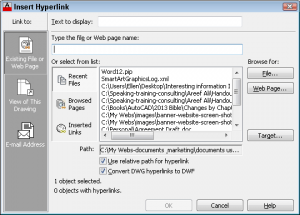 Start the HYPERLINK command (Insert tab> Data panel> Hyperlink or Ctrl+K). At the Select objects: prompt, select the object or objects that you want to hyperlink. In our example, it would be some text that describes the view. Press Enter to end object selection. The Insert Hyperlink dialog box opens. In the left panel, click View of This Drawing. In the center panel, expand the location of the view, in this case Model, and choose the View from the list of existing views. Click OK to close the Insert Hyperlink dialog box. To use your hyperlink, hover over the hyperlinked object until you see the hyperlink cursor. Then press Ctrl + click to go to the view you specified. To return to your list of hyperlinks, choose View tab> Back or choose Zoom Previous from the Nav bar. How could you use this technique? Leave a comment!